http://dementiaelevator.ie/wp-content/uploads/2013/10/asi_logo_fit.jpg 114 320 de_admin http://www.dementiaelevator.ie/wp-content/uploads/2013/10/logo_340x156.png de_admin2016-10-20 19:27:592016-10-20 19:27:59The Dementia Friendly Communities Toolkit - now available. 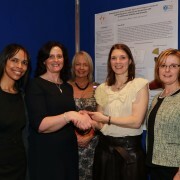 http://dementiaelevator.ie/wp-content/uploads/2016/08/news2.jpg 839 590 de_admin http://www.dementiaelevator.ie/wp-content/uploads/2013/10/logo_340x156.png de_admin2016-08-17 11:23:162016-08-17 11:23:16New resource on Nutrition and Dementia by the HSE and Irish Nutrition and Dietitics Institute (INDI) now available. Dementia and Every Day Ethics Module ​ – applications now open! This is a blended learning module involving 2 days of in-class education and 12 weeks of online learning. The module takes a person centered approach and covers a number of core ethical principles in working with people with dementia in a wide range of circumstances and contexts. 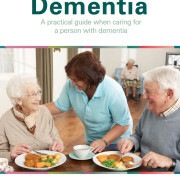 This module will equip students with the skills to recognise situations in everyday dementia care that are ethical in nature and how to guide colleagues in a helpful manner through a decision making process. It will also equip them with a practical and theoretical grounding in ethical decision making. There will be a wide range of topics covered including physical care and ethical situations arising. Social context and ethical issues concerning stigma and social isolation will also be central themes. Such issues will be explored from the perspective of the person with dementia, their family and communities in which these people live. The module will be predominantly scenario led, covering issues such as regarding, hydration and nutrition, continence, hygiene, responsive behaviours, pain, continence, sleep patterns and antipsychotic medication​. Click here for the word flyer for the course. http://www.dementiaelevator.ie/wp-content/uploads/2013/10/logo_340x156.png 0 0 de_admin http://www.dementiaelevator.ie/wp-content/uploads/2013/10/logo_340x156.png de_admin2015-11-22 15:21:222015-11-25 08:25:10Dementia and Every Day Ethics Module ​ - applications now open! Dementia Coping Skills for Families and Carers. A description of the course is outlined below. The Dementia Elevator Coping Skills for Families and Carers was developed to support and educate families and carers, while caring for a person with dementia. The programme aims to enable families and carers to recognise the emotions, goals and coping strategies of the person with dementia. It will enable participants to develop a suite of psychosocial skills in emotional and cognitive approaches to support these, while practicing self-care. The programme was developed in close collaboration with a group of family carers who shared their experiences in a number of filmed interviews. This comprehensive programme will require a total duration of approximately 4 hours to complete. However, the actual time to complete the programme can vary across users, as the content within each chapter is flexible and can be used as a stand-alone education. The programme consists of an introduction and five chapters. Each chapter is further subdivided into at least three sections. Exploration of theory of psychosocial approaches to support a person with dementia. http://www.dementiaelevator.ie/wp-content/uploads/2013/10/logo_340x156.png 0 0 de_admin http://www.dementiaelevator.ie/wp-content/uploads/2013/10/logo_340x156.png de_admin2015-11-22 14:54:102015-11-22 14:54:10Dementia Coping Skills for Families and Carers. 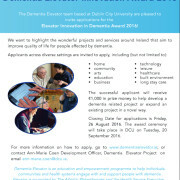 The Elevator team are pleased to invite applications for the second Innovation in Dementia Award! This award will be presented to a project that plays a role in improving the quality of life of people with dementia, their caregivers, loved ones, and/or health professionals working in dementia care. Applicants across all settings including (but not limited to) home, community, and healthcare are invited to apply. The successful applicant will receive €1,000 in prize money to help develop a dementia related project or expand an existing project in a novel way. We are also extending a special invitation to Dublin City University, Dementia Champions students who have completed a dementia care change project. The change project must be currently in operation or about to get underway. These applications will automatically qualify for the Dementia Champions award category as well as being considered for the main Elevator Innovation Award. 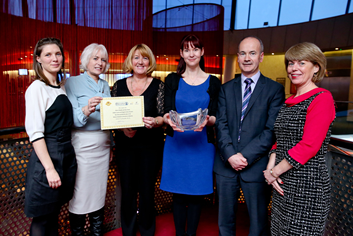 The winner of the Dementia Champions change project award will be announced at the ceremony. The closing date for applications is 5pm on Friday the 2nd of October 2015. 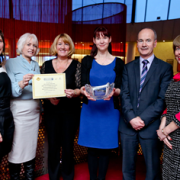 For more information click here: Elevator Award for Innovation in Dementia 2015 – Information Document. The application form can be downloaded here: ElevatorAwardApplicationForm1.docx 2015. 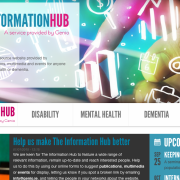 Genio has launched a new site called The Information Hub, www.informationhub.ie. This is a dedicated resource website provided by Genio which brings together publications, multimedia and events for anyone with an interest in disability, mental health or dementia. The website contains relevant publications including books, papers and reports, legislation and policy, or news and magazines. You can browse a range of useful multimedia including websites, slides, podcasts and videos. On the website, you can also find out about events taking place which may be of interest. Genio has developed The Information Hub in response to an identified need for a convenient way of finding and sharing useful resources which has emerged across the three areas we currently work in. While information on Genio developments will always be shared on the Genio website, Genio is providing The Information Hub as a standalone online service which is dedicated solely to displaying a directory of resources in a way which is easy for people to understand and navigate.